mance parameters," states Sawler. "With either approach, that helps our customers differentiate themselves and strengthens their positions in the market." Of course, manufacturing plays a pivotal role in CPP film development. Because of the depth and breadth of the product range, there is no such thing as a dedicated production line at Copol. The firm will combine orders from various customers in a single production run as needed, says Lanoë. 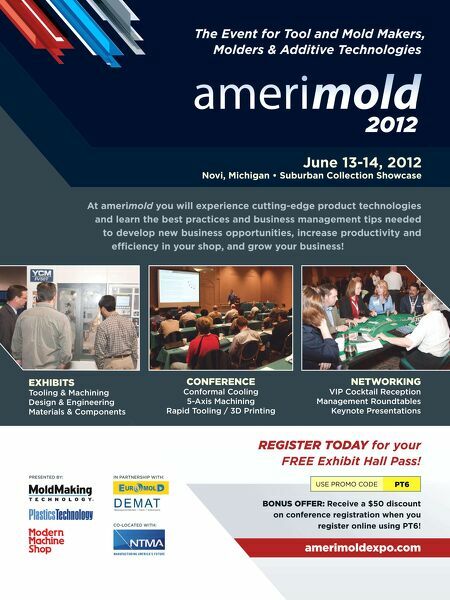 Compressed lead times have encouraged Copol to innovate in areas beyond manufacturing. "About 95% of our business is door-to-door," states Daehler. "With so many different prod- ucts of different quantities going to different places, the logis- tics can be very challenging." Dahler continues, "The logistics component of managing a relationship is just as important as delivering quality and consistency. So when a customer places an order with us, we have developed a process whereby everything is scheduled at the same time: extrusion, slitting, up to and including the space on the truck that we will need." AGILITY, INNOVATION With rising consumer demand for convenience-food preparation and "meals ready to eat," Copol offers a series of CPP film prod- ucts used primarily as sealant layers in multi-layer laminate structures for retort applications. Copol's RP423BX series of coextruded CPP film products takes aim at the growing and technically demanding freezer-to- microwave steam cooking market. They are used in laminate structures with converter-proprietary, self-venting mechanisms designed into the final package. The basic film material (offered in both white tint and clear) combines toughness and a broad operating temperature range. It offers excellent low-temperature impact properties down to –10 C while at the same time offering high heat resistance up to 150 C. Available products include a clear, slip-modified, three-layer, impact-copolymer-based film offering good contact optics and good impact properties down to –10 C. A white tint version that maintains all of the other properties of the clear product is also available. Never satisfied with the status quo, Copol is also combining innovation with new processing capabilities to develop new CPP film products for ever more demanding packaging applications. The first series of Copol's new multilayer films will target lidding applications with the combination of exceptional sealing performance and predictable and consistent peel characteristics. This class of product will enhance packaged product freshness and security while at the same time offer convenience of opening for the consumer. The second series of multilayer films will combine excep- tional optical properties with improved low-temperature perfor- mance. Copol also has the capability to micro-perforate virtually all of its CPP film products using hot-needle perforation technology. 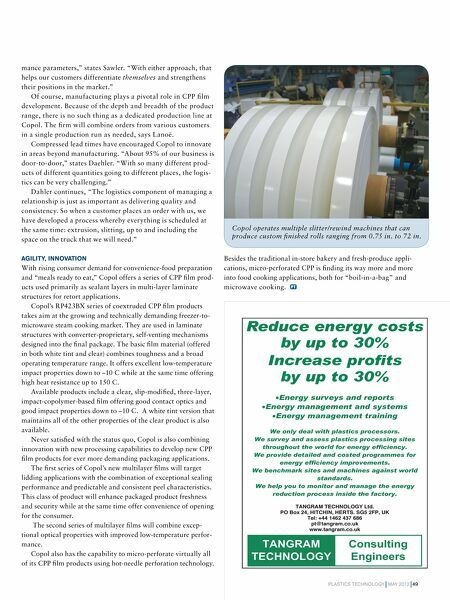 PLASTICS TECHNOLOGY MAY 2012 49 Copol operates multiple slitter/rewind machines that can produce custom finished rolls ranging from 0.75 in. to 72 in. Besides the traditional in-store bakery and fresh-produce appli- cations, micro-perforated CPP is finding its way more and more into food cooking applications, both for "boil-in-a-bag" and microwave cooking.